I received this beautiful first edition hardcover as a birthday gift (from two good friends whose distilled and parsimoniously public creativity can be viewed here) at least two birthdays ago and I finally got around to reading it. 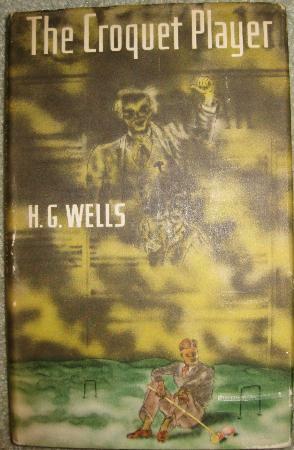 It's one of Wells' later works, written in 1937 and is both an excellent tale of horror in the Lovecraft mould and a disturbing, though none too subtle, foreshadowing of the horrors of the Second World War that were soon to be upon Europe. It's short, barely a novella. The book begins with the narrator introducing himself, in the chapter entitled Introduces Himself. The character is the cliché of the useless British upper class remittance man. He is a bachelor and expert croquet player who lives with his wealthy aunt and is realistically aware of his own shortcomings. It is actually quite a funny portrayal. The story begins with our narrator sitting on the terraces at Les Noupets, "nibbling a brioche and consuming a harmless vermouth and seltzer." He notices a man at the table next to him furiously flipping through book after book. They being to converse and it is the story of the other man that is the main narrative of the book. He is a middle-class doctor, who due to some stress decided to open a practice out in the country. He moves to Cainsmarsh, an isolated rural area near a large marsh. He discovers the locals to be suffering under some general anxiety and fear, feelings which soon start to invade his own consciousness. Violent crimes occur in Cainsmarsh at a much higher rate than would be expected. People are excessively cruel to their animals. The doctor becomes more and more unhinged, but decides to try to investigate, as is the duty of a rational man. I'm not going to give away spoilers. There are themes here we find in some of Wells earlier work about man and his relationship to the beast of the wild. The Croquet Player, though, is more explicitly horror in its stylings, actually quite creepy. I always love Wells' english and reading this book reminds me that I need to read him more. He does a great job of describing the region of Cainsmarsh and the phenomenon that is happening there. I'll give a slight spoiler and say that the thematic undertone, that man's beastly side is returning and threatens to rip civilization apart, is done with too heavy a hand in the end, though perhaps given how close Britain was to the dawn of war, subtlety was not really an appropriate approach at that time. You should read this book for yourself. It's in the public domain and you can find it here. He was soon launched upon the wildest diatribe. He was transfigured by an anger that shook his feeble frame. He had fixed upon the local archæologists and naturalists as the chief objective for his tirade, but mixed up with that in the oddest and most illogical way was his detestation of the high-church practices that had been introduced by the new man at Marsh Havering. Just when this Evil was being released and rising like an exhalation from the earth, when the one supreme need of the time was religion straight and stern—'STRAIGHT AND STERN,' he repeated and shook his fingers in my face—this man must come with his vestments and images and music and mummery! 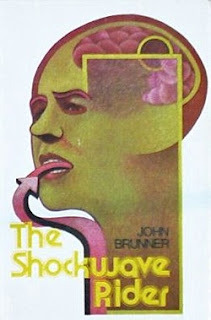 John Brunner has long been on my list of sci-fi authors to read. I found a nice hardcover book club edition with this cover on it at one of my two (!) local english used bookstores. I suspect that this was perhaps not the perfect choice of a Brunner novel to read. It has some cool ideas and the beginning in particular was enjoyably disorienting, but it gets bogged down in philosophical conjectures without having built up a convincing enough world to make them interesting. It takes place in the not too distant future in a semi-dystopian North American society where everyone has a unique ID and people's identities are based on the data about them. Sounds topical, doesn't it? It is and isn't because Brunner's prediction of the size and nature of external data was way off (a massive worm program that dominates the network is a million bits long for instance. One can't fault him for this, as it was written in the early '70s and there are some concepts that he totally nailed (the worm for instance). The main character is a genius who escaped from an elite university and now switches from life to life by changing his identity number. He lives in a state of fear, constantly trying to stay one step ahead of the authorities that he fears are searching for him. This part of the book is quite cool. It is interspersed with future scenes of him being interrogated, which lets the reader know that he does indeed get caught. The narrative gets going when he takes the role of a corporate analyst and meets the free-spirited daughter of one of his colleagues. She guesses that he is not who he says he is and this is the catalyst that sets the two of them on the run. It sounds pretty straightforward, but there are too many socio-philosophical digressions. Much of their discussion is based on concepts put forth in the book which aren't well-grounded enough in the actual story, so you kind of don't really care. You can read the political subtext in it as well, but it's Brunner extrapolating what a post-Nixonian world would look like 50 years from when he wrote it. It all gets a bit obscure. Then in the last third of the book, the scope suddenly becomes quite massive, with the hero basically taking down the entire system. It just didn't hold together well for me. So an interesting book with some neat concepts, but not a great story. Anyone have a better Brunner book to recommend?